Rory McIlroy and Jimmy Fallon before facing off in the Happy Gilmore Putting Contest on the Tonight Show. 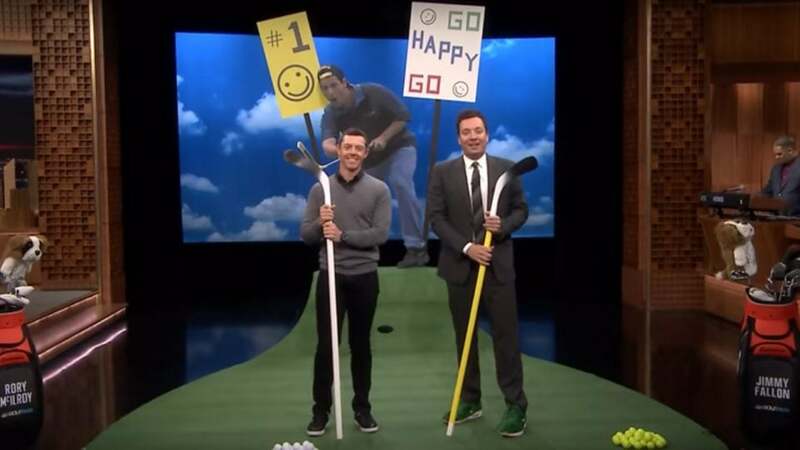 Jimmy Fallon has taken on the likes of Tiger Woods and Charles Barkley in golf challenges on The Tonight Show, and he found a new rival last night: Rory McIlroy. The pair faced off in a "Happy Gilmore-style" putting contest with hockey sticks Monday on the late-night talk show. McIlroy is making the rounds to publicize GolfPass, a new venture from NBC. One of those stops was an appearance on Fallon's show Monday night in New York, and Fallon came prepared. After noting that he heard "Happy Gilmore" was his favorite golf movie, Fallon challenged Rory to a putting contest based on the movie. Wielding hockey sticks in the fashion of Happy's custom flatstick, the two frantically tried to sink as many putts as they could in 30 seconds on an uphill-sloping putting green (topped with a cut out of Adam Sandler in his iconic role). https://www.youtube.com/watch?v=IK0u1eArVlE The challenge turned out to be harder than expected. When the buzzer sounded, the score stood at a dead-even tie of 4-4, to which McIlroy exclaimed in disappointment, "NO!" McIlroy makes his next PGA Tour start at the 2019 Genesis Open in one week. The event, which is played at Riviera Country Club in California, is hosted by Tiger Woods. McIlroy will have to iron out his putting issues by then if he wants to beat the tournament host in his second start of the year. Unsurprisingly, this was not Rory's first appearance on The Tonight Show Starring Jimmy Fallon. McIlroy made a joint appearance on the show with Woods in 2014 to promote a new set of Nike irons.